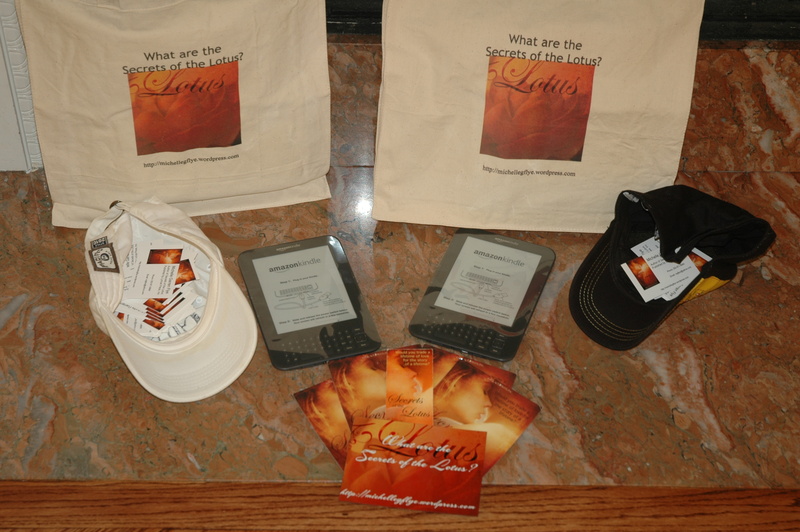 I’ve taken the picture with a selection of SECRETS OF THE LOTUS goodies that I plan to include and the hats with the current entries. Remember, if you want to register for Kindle #1, leave a comment on this blog or email me at michellegflye@gmail.com. If you’d like to register for Kindle #2 (on the right), you have to blog or post about my giveaway on your Facebook page, then email me and let me know what you did. Chances are much better for Kindle #2 right now! A final request to the good people who have already read my book. Please consider reviewing it on one or more of the sites listed above. You never know who might decide to read it if you do! Hope you’re all having a great holiday season and taking lots of breathing moments to appreciate your family, friends and loved ones. Hope to win this. Its at the top of my Xmas list. Your book sounds wonderful by the way. And I love what you are doing with your royalties. You seem like such a great person. Thanks, Misty! And thanks for the shout out on your blog! I’ve entered you in both hats. Good luck! You’re so generous with your royalties Michelle. I truly think that it’s a wonderful thing to do and to spread the love. You seem like such a nice person.